There are a lot of delightful things about living in San Diego, it’s kind of hard to complain about it (especially in January). Fall is one of the best times to visit southern California; it’s still really warm, the beaches are empty, the water is at its best temperature, and unlike the May-gray and June-gloom of spring, the days are generally sunny and bright. However, if you’ve grown up in colder climates like I did, there are a few things you need to adjust to because we also have Santa Ana heat waves which will rot your beautifully carved pumpkins in less than a day. We’ve learned not to carve our pumpkins but to decorate the outside instead. We’ve used glue and sparkly beads from our local craft store, painted on spider webs and when my nieces were around there always seemed to be glitter involved. I just saw a cute idea that used blackboard paint and chalk. My favorite design requires a quick visit to your local hardware store instead of the craft store. 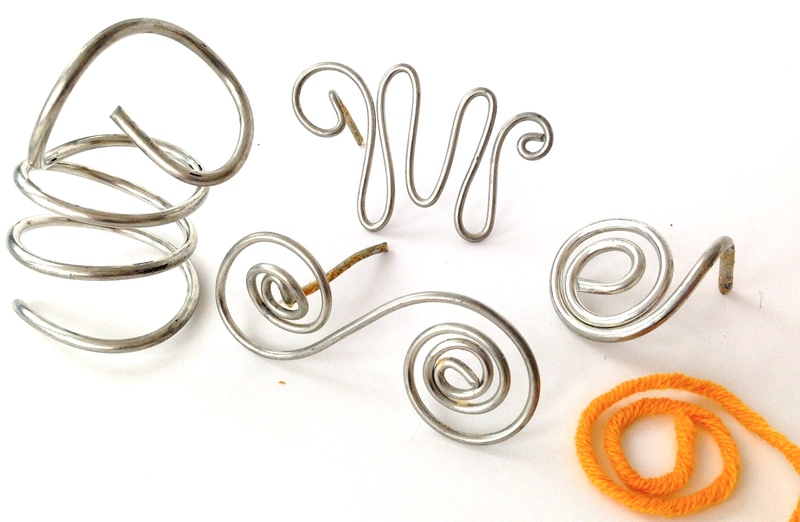 What You Need: These spirals are made of soldering wire! 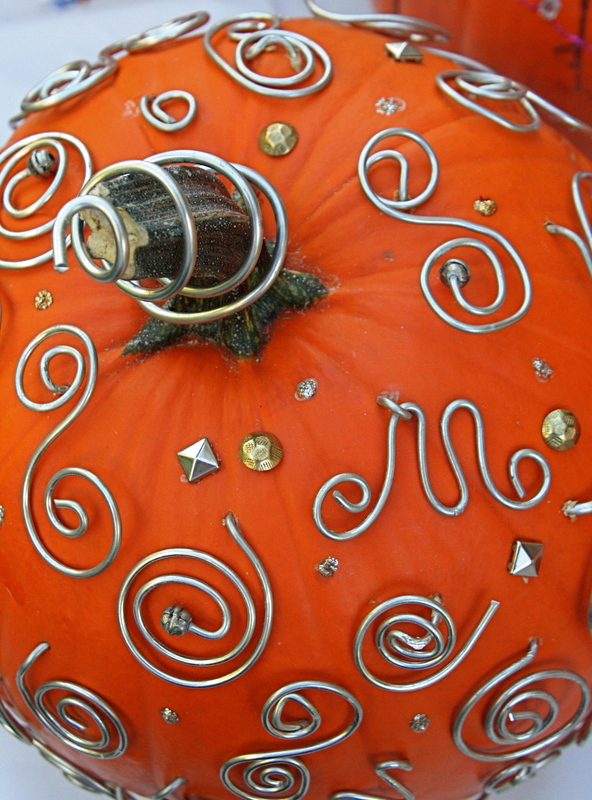 All you need is a small phillips head screwdriver to knock some holes into your pumpkin and a pair of pliers to help smoothly twist the wire. A strong pair of kitchen scissors will work but I like to use wire cutters. You can see I also use some upholstery tacks. Want even more bling? You can always spray paint the wire silver or gold. 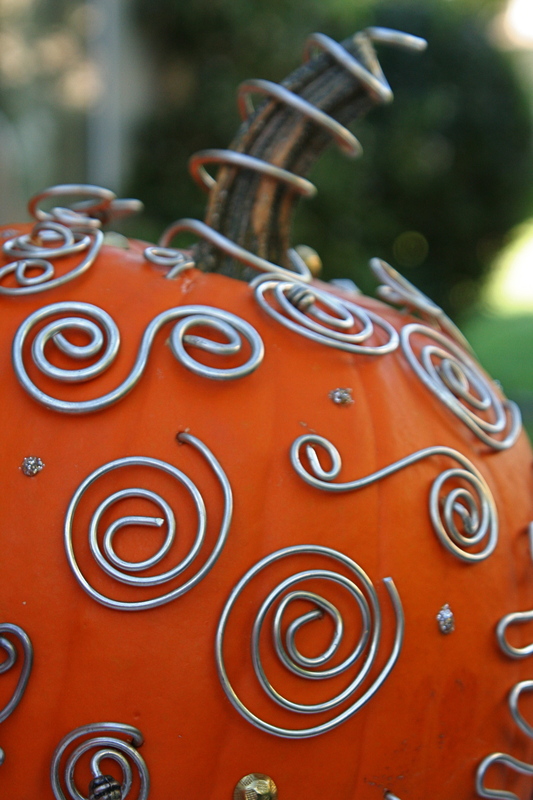 Each of your spirals needs a 1″ section of wire bent at a 90 degree angle to push into the pumpkin. No knives make this a great kids project. If you look closely at the top photo, you’ll see there are two difference weights of wire. I found the lighter one easier to manipulate. I no longer have the weight of the wire but I would say the thinner one looks like it’s similar to DK weight and the heavier a sport weight. Now that’s a comparison I bet no one’s made before. Bring Them Inside: These sophisticated pumpkins make gorgeous centerpieces and there’s no reason you can’t use them all the way to Thanksgiving. They Make Great Gifts Too: Need a thoughtful hostess gift? Bring a pumpkin! Why not bring one to your office? I made one for the front office at my kids’ school one year and we raffled a few off to support the PTA at Fall Fest. They Last for Years: I made these spirals several years ago and reuse them every year. Just make sure to thoroughly clean them before putting them away. How ’bout it? Ready to give this a try? I’d love to hear some of your favorite pumpkin decorating ideas. This entry was posted on October 13, 2014 by Laura Cunitz in Other Ideas and tagged Pumpkin Decorating.